Thank You Note to QRF Competitors, Their Support Teams, Friends and Volunteers! Dear QRF Competitors their Support Teams, Friends and Volunteers! Thank you to everyone who helped to make this a very successful Horse Trials. Without your support it could not have happened! Our Training level division was won by Stephanie Burkhardt and her 6 y/o TB Salieri. 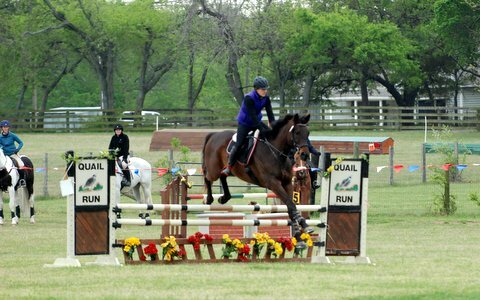 This was “Eri’s” very first attempt at Training level and his second season eventing. Congratulation to Stephanie who ALSO RAN the Start Box with Abigail Johnson! Thank you both! Jennifer Burk won the Novice Division with Gabe’s Gold on her dressage score of 31.9! Congratulations! In Beginner Novice, we had 10 senior riders and only 4 juniors. We split the final scores into two divisions giving the best score & First Place BN A Division to Senior rider Kelly Green on Woodstock Classic Rock who had the BEST SCORE OF THE DAY with a 26.7. She also earned the TRI COLORED RIBBON for that Score! It is waiting for you Kelly, hope to see you soon! Congratulations! The second best score in Beginner Novice went to Susan Gwynn and homebred Magellan, with a 30. Susan and Magellan headed the BN B Group into First Place for the second time this year at QRF! Congratulations! Splitting the group in this way saves riders from saying “Had I been in the other group I would have won having had a better score than the winner in that division”! We had a lot of new riders in our Jump Start- Pre BN Division. We combined the group and gave the braver riders the opportunity to improve their FINAL SCORE by jumping our TWO Bold Options each option awarding a 1 point improvement in final score! A jump Judge had written “passed” on the score sheet and our scorer assumed that Sophia Peters had passed the jump and not jumped it and gave her a Technical Elimination TE. Having followed Sophia in my car I knew she had gone clear and even jumped the big 2’3” final Option #13. This clerical error put Maddie Bauer in first place with a 44.2. When the error was corrected Sophia became our FIRST PLACE winner with a score of 39.3! This was Sophia’s first Horse Trials! Both girls received Blue Ribbons and AWARDS! Congratulations to both girls who were unaware of our mistakes! ERRORS Happen! This is why it is SO important to check the score board throughout the day. PLEASE do NOT hesitate to politely question the results if you feel that there has been a mistake! In a Recognized USEA HT we have to WAIT 30 minutes AFTER the FINAL SCORES are posted before presenting awards! Make sure that you check the score board in that time period! My husband Peter took 300 photos during the day. Our website, www.quailrunfarm.net. Is in the process of being re built. We are trying to figure out the best way to share them with you. I will post some on Facebook! We wish to personally thank our wonderful Dressage Judge Trisha Wallace a USDF GOLD Medal recipient for her expertise and numerous encouraging comments! I hope that you all learned from them! Thank you to her scribes and dressage stewards; Nicole Hackett, Ginger Stuek, Judy Frappier, Philippe Guillet . Thank you to our wonderful Show Jumping Judge, Lynne Partridge and her helpers, Lucy White, Brenda Sheets, and Kim Dickman. Thank you to Stephanie and Abby who ran Start Box and to our Jump Judges and timers, Janet Otto, Chris and Jessica , Susan Foust, Cathy Mc Call, Faith An McMahon, Brenda Sheets. It really takes a village to run a Horse Trials smoothly! Please contact any organizer when you are about to compete and offer your assistance, if only for 30 minutes here or there to relive another volunteer for a “potty break”, we SO appreciate our volunteers! If you are a competitor PLEASE be sure to thank our volunteers, without whom Horse Trials could not take place! Thanks to any other volunteers whose names I may have omitted to mention! We wish to thank SILVER STIRRUP PONY CLUB for hosting the great Food Stand and for preparing lunches for all our volunteers. 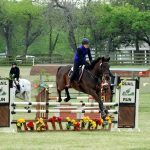 Louise Jensen, now Rudolf, former Pony Clubber and Quail Run Farm teenage competitor headed up the Pony Club Café with the help of husband and adorable children. Louise made delicious burritos and brownies and other homemade goodies. US Pony Club is for young people 6-21years. PC now offer a Horse Masters’ program for adults wishing to learn correct horsemanship and riding skills in ALL disciplines, even Western and Vaulting! PC is an International organization. Contact United States Pony Club for further details! We hope to see you all at our BEAT the HEAT August 19th, Combined Test in the Pecan Grove. It has traditionally been the coolest day in August and we even received rain a couple of years ago which made the going EVEN better! A word on behalf of ALL organizers! PLEASE send in your entries at opening date and well before closing date. Late entries are a nightmare for secretaries and for organizers. I try and plan our courses around our competitors’ needs and experience. At recognized HT it is very expensive to suddenly hire a judge to fly in from east or west coast at 4 days’ notice due to late entries! Organizers have to order portable stabling in advance. If entries come on time, organizers can be more efficient and competitors can get their times far sooner. Thank you all for coming, we hope that you had a great time and wonderful learning experience!